Purpose: Mutual production of proinflammatory cytokines causes a deleterious cyclic relationship between uncontrolled diabetes and periodontal disease. The prevalence of diabetes is escalating out of control. Early detection of pre-diabetes and diabetes may respectively prevent or delay disease onset and eliminate or decrease complications. The dental office offers an opportune site for diabetes screening. This study investigated the ability to precisely screen previously unidentified dental patients for diabetes and pre-diabetes. Methods: In this predictive correlational study, participants were chosen by convenience sampling, and were included based on self-proclaimed risk factors. 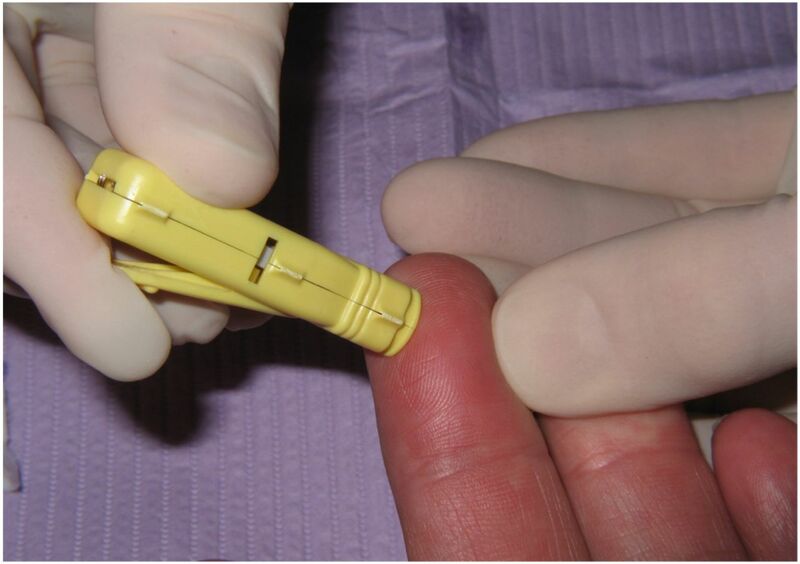 A point-of-care (POC) fingerstick HbA1c screening identified participants for confirming venous HbA1c laboratory screenings. Kendall's tau analyzed the relationship between POC HbA1c results and classification as diabetic or pre-diabetic based on laboratory HbA1c results. Chi Square, Likelihood Ratio, Cramer's V and Lambda compared the expected and observed results. Results: Of the 104 diabetes risk questionnaires completed, 75 participants were included in the POC screening. Of these, 34 (71% female and 29% male) had HbA1c levels at or above the American Diabetes Association's (ADA) recommended 5.7% cut-point for pre-diabetes. Three participants were less than age 44, 10 were 44 to 57, and 21 were over 57. Laboratory results categorized 6 participants as normoglycemic and 28 with HbA1c greater than or equal to 5.7%. Kendall's tau (p=0.004) determined POC results can predict diabetic or pre-diabetic laboratory group assignment. Pearson's chi-square (p=0.004), Likelihood ratio (p=0.004) and Cramer's V (p<0.001) concluded a relationship existed between group assignment based on POC HbA1c results and those of subsequent laboratory HbA1c results; Lambda (p=0.145) did not. 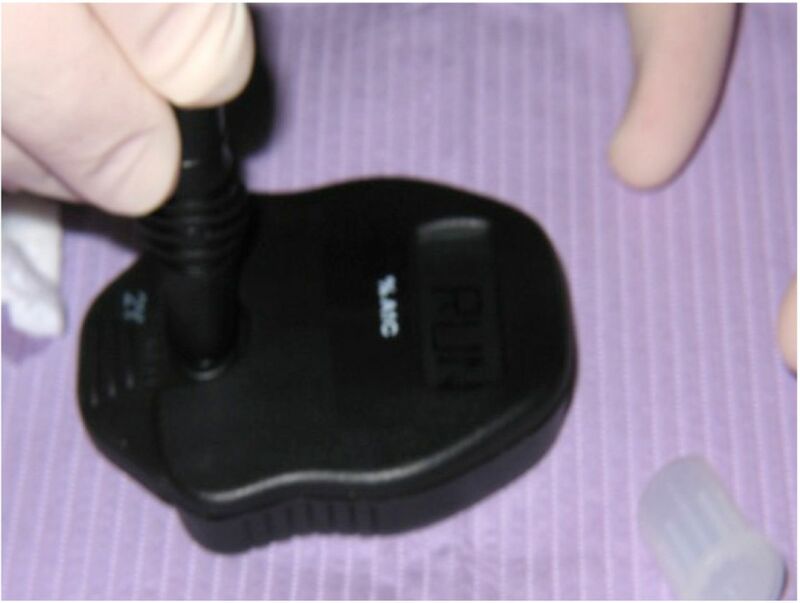 Conclusion: Within the limits of this study, it was established that a safe and minimally invasive dental chair-side POC HbA1c screening unveiled previously unidentified diabetic and pre-diabetic patients. Today, after years of research, it is known that the relationship between diabetes and periodontal disease is bidirectional, affected by risk factors and promoted by a biochemical cascade of events (Figure 1).3,7-16 Blood accumulations of advanced glycation end products (AGEs) in persons with prolonged hyperglycemia and of lipopolysaccharides (LPS) from the lyses of periodontal bacteria, stimulate macrophages to secrete the proinflammatory cytokines tumor necrosis factor-alpha (TNF-α), interleukin-1 (IL-1), and interleukin-6 (IL-6).10 These cytokines lead to the destruction and retarded healing of periodontal tissues and to insulin resistance.10 Either disease is less likely to be well controlled if the other one is not. This study investigated the ability to accurately screen previously unidentified dental patients for diabetes and pre-diabetes using a chair-side HbA1c screening method compared to a laboratory HbA1c screening method. The hypothesis tested was: A POC HbA1c screening will reliably identify dental clients who have self-proclaimed diabetes risk factors, as diabetic or pre-diabetic when compared to a laboratory HbA1c screening method. Participants were chosen from a dental hygiene school (site #1) and a private practice (site #2) in this 2-armed, predictive correlational study. Protocol approval was obtained from the Eastern Washington University Institutional Review Board (IRB) for Human Subjects Research committee. The investigators were held to stringent ethics, procedures and confidentiality. The Washington State Department of Health Office of Laboratory Quality Assurance issued a medical test site certificate of waiver license for use of the POC HbA1c screening kit (A1CNow+®, Bayer Healthcare, LLC), because it is a Food and Drug Administration (FDA) waived test as determined by the Clinical Laboratory Improvement Act (CLIA) of 1988. To achieve statistical significance, a power analysis determined that a minimum of 21 laboratory results were required for valid research. Consequently, a goal to obtain 30 participants with elevated POC HbA1c results was established. Based on this goal and results of previous self-proclaimed diabetes risk factor research,32 it was expected that between 95 and 112 at-will participants would need to complete the diabetes risk questionnaire in order to obtain sufficient numbers of participants meeting inclusion criteria (Table I). The diabetes risk questionnaire was developed by the researcher based on Heikes32 validated diabetes risk algorithm and used with permission (Bowman, personal communication, August 2010). Participants were excluded from screening if they had previous positive blood glucose tests, hemoglobin traits or conditions that would potentially produce aberrant HbA1c results, insufficient diabetes risk, or factors that increase screening risk to the participant or the researcher (Figure 2). A total of 75 participants met the inclusion criteria and subsequently signed an IRB approved informed consent. Age, gender and ethnicity data were collected to describe the sample and determine generalization of the research results in relationship to demographics published by the ADA. The participant's blood pressure was measured and recorded since elevated blood pressure is common in diabetics. 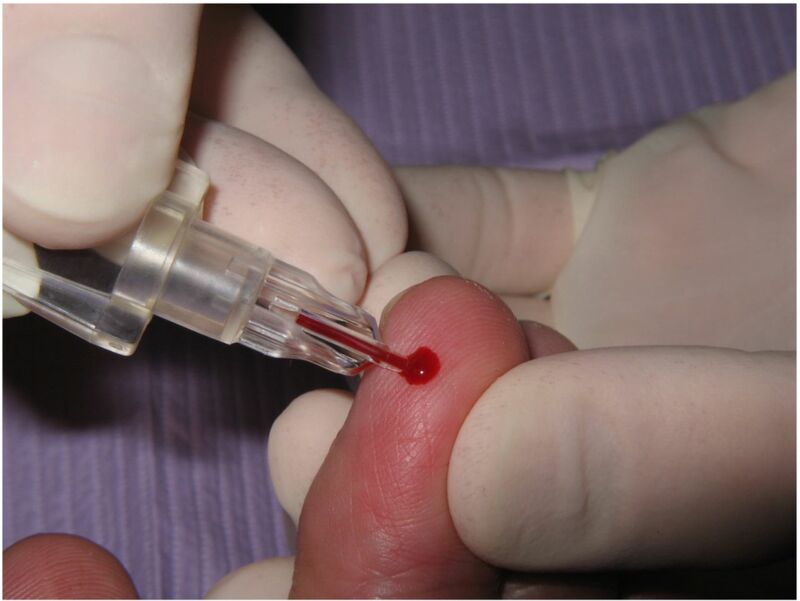 With good laboratory practices and standard precautions, calibrated co-investigators obtained a fingerstick blood droplet using a single-use, sterile, retractable lancet (Figures 3A, 3B and 3C). 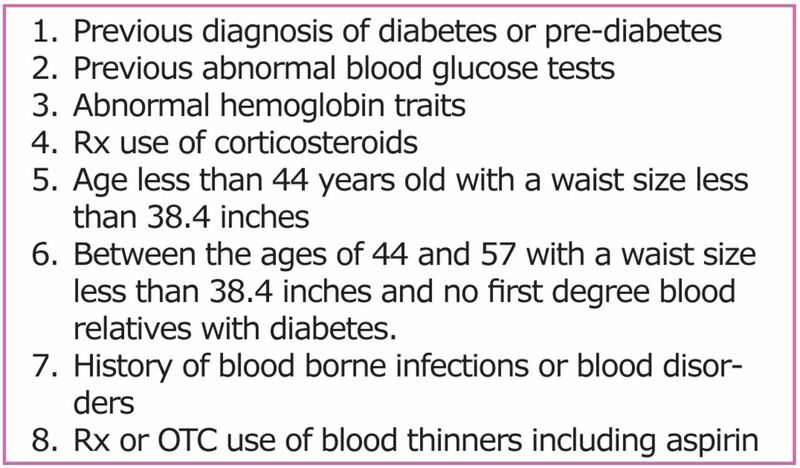 Trained in the proper storage, handling and technique for using the POC HbA1c screening kit, co-investigators acquired POC HbA1c results (Figure 4A, B, C and D) and made laboratory screening referrals for those with results at, or above, the ADA's recommended pre-diabetes cut point (Table II). POC and laboratory results were assigned to diabetic categories according to the ADA's standard of clinical care cut points (Table II). Laboratory results were delivered to participants concurrent with nutritional and diabetes educational counseling and referral to a licensed medical professional. Two rounds of statistical tests were conducted in SPSS software (Version 19) following suggested guidelines.33 In the first round, Kendall's tau, a nonparametric statistical test, evaluated whether the POC results could predict laboratory result group assignment, i.e. diabetes or pre-diabetes, because it measures the association between values of rank order and group membership when data is ranked and the results are not normally distributed. In the second round, 4 additional statistical tests evaluated the results for significance (p≤0.05). The Chi Square statistical tests measured the differences between the expected and observed laboratory groups - the Likelihood ratio compared the frequencies of expected and observed groups, Cramer's V measured the strength of association between the expected and the observed groups and Lambda measured the proportional reduction in error when one group predicts the other, i.e. POC diabetic category predicting the laboratory diabetic category. 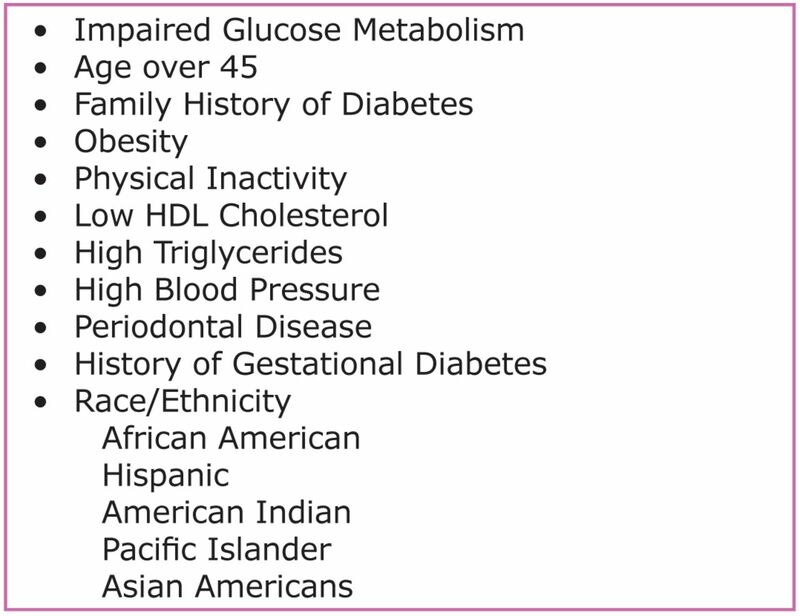 From the 104 diabetes risk questionnaires completed, 75 individuals were identified for inclusion in the study (Table III), who were predominately Caucasian, female, older than 57 years, having a waist size larger than 38.4 inches and weighing over 168 pounds. Few were shorter than 5 foot 3 inches and slightly less than one-third of the participants had diabetic first degree blood relatives. The POC screening better identified participants with more notable diabetes characteristics than the diabetes risk questionnaire (Table III). Study results mirrored national statistics for the percentage of diabetics by age group and for the blood pressure of diabetics. As shown in Table I, laboratory screening results confirmed POC screening results for 28 of the 34 participants at or above the cut point between normal glycemic and pre-diabetic blood levels. Those participants were directed to seek medical evaluation and consultation. Researchers made up to 3 attempts to obtain details of medical follow-ups. Of referred participants, 82% responded to these attempts. One respondent with a laboratory result greater than 6.5% (the cut point between diabetes and pre-diabetes) and one with a laboratory result in the pre-diabetes category reported that the medical provider recommended lifestyle changes and a re-evaluation in 4 and 6 months, respectively. Another participant with laboratory results in the diabetic range was encouraged to make lifestyle changes and was prescribed Metformin, a drug that decreases the amount of glucose absorbed from food and increases the body's response to insulin. A total of 45% of respondents did not follow up with a medical provider. The remaining 45% were reassured by a medical provider that the laboratory results were of no consequence (Table IV). Statistical analysis was completed with data combined from the 2 research sites because they were not found to be statistically different. Table V illustrates the abnormal distribution in the association between the POC ranked values and the laboratory result assignment into its respective diabetes category. In the first round of statistical analysis (Table VI), the result value (0.439) and significance (p<0.05) of Kendall's tau indicate that the POC HbA1c screening result prediction is statistically significant for the subsequent laboratory diabetes category assignment. More POC results in the diabetic and pre-diabetic range were observed than expected, but fewer laboratory results in the diabetic and pre-diabetic range were observed than expected (Table I). In the second round of statistical analyses (Table VII), 3 of the 4 tests executed to analyze an association between the POC and the laboratory screening results demonstrated statistical significance: Chi Square (p=0.004), Likelihood ratio (p=0.004) and Cramer's V (p<0.001). Lambda (p=0.145) was the exception and did not show statistical significance. The study found that POC screening results could predict normal, pre-diabetic or diabetic group membership as confirmed by subsequent laboratory HbA1c screenings. Data from NHANES III public use files reveals that self-reported diabetes risk factors determines diabetes in 27 to 53% (40% average) of the cases.26 Of the 75 at-will research participants who demonstrated sufficient self-reported risk factors, 28 (37%) were confirmed as diabetic or pre-diabetic by POC screening followed by subsequent laboratory screenings. Exclusion criteria included previous diabetes or pre-diabetes diagnosis, pregnancy, abnormal hemoglobin traits, history of blood-borne infections, use of corticosteroids, or over-the-counter (OTC) or prescription blood thinners, such as aspirin or Coumadin, respectively. Staying true to exclusion criteria utilized in previous research, such as only previous diabetes or pre-diabetes diagnosis, pregnancy or abnormal hemoglobin traits, would also improve the sample.17,21,25,26 To the knowledge of the researchers, no other research excluded participants with a history of blood-borne infections or the use of blood thinners. The IRB required these exclusions. The researchers assume that the exclusion of those with a history of blood-borne infections was to protect research participants and researchers from cross contamination. According to the CDC's 2011 Diabetes Fact Sheet, in 2004 heart disease and stroke were respectively listed on 68% and 16% of diabetes-related death certificates of those age 65 and older,1 and blood thinners are frequently recommended for a history of vascular disease, which is often concurrent with diabetes.36,37 An assumption could be drawn that there exists a likelihood that undiagnosed diabetic and pre-diabetic individuals may be self-medicating with OTC blood thinners or may be taking a prescription blood thinner for vascular disease under the direction of a physician. Excluding these individuals from screening decreases the sample size, therefore decreasing the power of the study and, furthermore, allows for the possibility of not identifying previously undiagnosed diabetes and pre-diabetes. Using the HbA1c assay for diabetes status has limitations including conditions that reduce the red blood cell turnover rate like hemolytic anemia, chronic malaria, major blood loss and blood transfusions, all of which give false results, or abnormal hemoglobin traits (i.e., sickle cell anemia) that interfere with some HbA1c assay methods.30 Because the POC kit used in this study had been shown to be 99.3% accurate,38 it was anticipated that the same number of participants would be categorized as pre-diabetic and diabetic from both the POC and laboratory assays; however, in this study only 28 of the 34 (82.4%) positive POC results were confirmed by laboratory results. One explanation might be that the kit used in this study was standardized to the Diabetes Control and Complications Trial (DCCT) assay in a National Glycohemoglobin Standardization Program (NGSP) certified laboratory39 and the laboratory processing the confirming screenings was not. National statistics indicate that 67% of diabetics, as defined with laboratory screening results of HbA1c of 6.4% or greater, have blood pressure equal to or greater than 140/90 or are taking hypertensive medications.40 Similarly, 2 participants in this study having laboratory screening results of 6.4% or greater had systolic measurements of 130 or more, while only 1 had diastolic measurements greater than 80. The participant with elevated systolic and diastolic blood pressure was also taking hypertensive medication. The prevalence of diagnosed and undiagnosed diabetes is low until age 40, when it increases to 10.8%, through age 59, and is 23.1% in those aged 60 and older.1 That is a ratio of 2.14 diabetics over the age of 59 for every one between the ages of 40 and 59. Of the 34 participants identified as diabetic or pre-diabetic in this study, 3 were less than age 44, 10 were aged 44 to 57, and 21 were over the age of 57. This study identified a ratio of 2.11 diabetic and pre-diabetic participants over the age of 57 for every one between the ages of 44 and 57. While this study's age categories were different than those of the national statistics, the ratio of diabetics in the highest age range compared to those in the mid-range of ages was very similar. The practical implication of this research is that it answers a call to action by increasing screening strategies, approaches and locations and, in turn, decreases the prevalence of diabetes and its adverse outcomes.41 Phillips et al stated “diabetes prevention and care are limited by lack of screening.”25 The screening in this study, if adopted universally, could lead to early detection of pre-diabetes or diabetes and consequently slow or prevent the complications of diabetes.17,18 Theoretically, this study implies that any office, in any location, with any population could include diabetes screening in their daily routines. 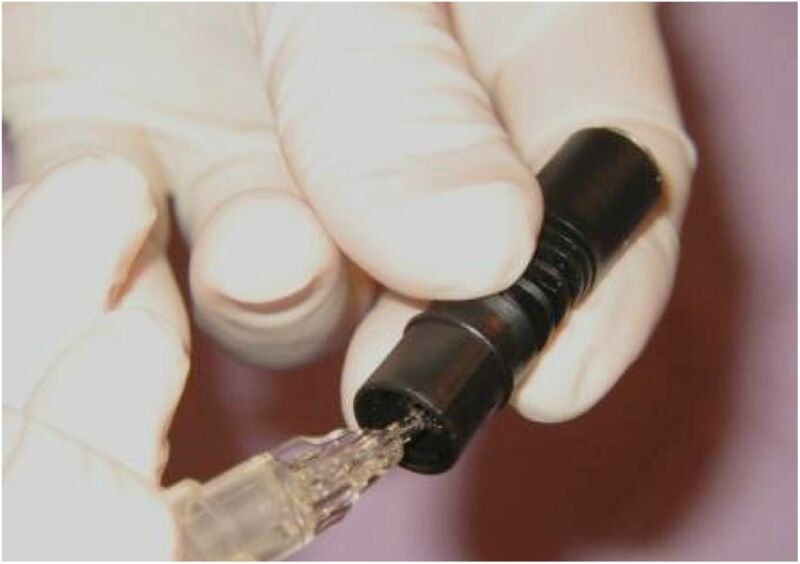 The purpose of screening in the dental office is not to diagnose diabetes, but to refer for medical diagnoses and treatment to improve systemic and oral outcomes.48 Medical and dental professionals are challenged to stay abreast of the ever changing flood of evidence in the literature regarding the severity of diabetes and the bidirectional relationship between diabetes and periodontal disease. Medical-dental education and collaborations for improved systemic and oral health of the population can be fostered via diabetes screening in the dental office. The authors would like to thank S. Dean Crews for statistical guidance and analysis, Debbie Weeks and Gregg Fletcher for supportive research data collection, Paul Mullasseril, Ann Wetmore and Sarah Jackson for clinical research data collection, the students and staff at EWU and WT Hilliard, DDS and staff at Pioneer Way Dental Center for subject recruitment, and Kim Crews for grant writing assistance. Susan D. Franck, RDH, MS was a graduate student in the Master of Science in Dental Hygiene degree program at Eastern Washington University (EWU) at the time of the study. Rebecca L. Stolberg, RDH, MS, is the EWU Dental Hygiene Department Chair, Bachelor's and Master's degree director and clinical instructor. Lisa A. Bilich, RDH, MEd, is an assistant professor and 2nd year clinic lead in the Department of Dental Hygiene at EWU. Laurie E. Payne, MS, RD, CDE, BC-ADM, is a Diabetes Educator for INHS Community Wellness, a division of Inland Northwest Health Services (INHS). This study supports the NDHRA priority area, Clinical Dental Hygiene Care: Develop and test interventions to reduce the incidence of oral disease in special at-risk populations (diabetics, tobacco users, cardiac patients and genetically susceptible).
. Projection of the year 2050 burden of diabetes in the US adult population: dynamic modeling of incidence, mortality, and prediabetes prevalence. Popul Health Metr. 2010;8:29.
. Periodontal disease and NIDDM in Pima Indians. Diabetes Care. 1990;13(8):836-840.
. Periodontal disease in non-insulin-dependent diabetes mellitus. J Periodontol. 1991;62(2):123-131.
. Oral Complications in Diabetes. In: National Diabetes Data Group, eds. Diabetes in America. Second ed. (NIH Publication No. 95-1468). Bethesda, MD: National Institutes of Health; 1995. 501-506 p.
. The relationship between reduction in periodontal inflammation and diabetes control: a report of 9 cases. J Periodontol. 1992;63(10):843-848.
. Inflammation and activated innate immunity in the pathogenesis of type 2 diabetes. Diabetes Care. 2004;27(3):813-823.
. Severe periodontitis and risk for poor glycemic control in patients with non-insulin dependent diabetes mellitus. J Periodontol. 1996;67(10):1085-1093.
. Periodontitis and diabetes interrelationships: role of inflammation. Ann Periodontol. 2001;6(1):125-137.
. Periodontal disease and diabetes mellitus: the role of tumor necrosis factor-alpha in a 2-way relationship. J Periodontol. 2003;74(1):97-102.
. Gingival crevicular fluid levels of interleukin-1ß and glycemic control in patients with chronic periodontitis and type 2 diabetes. J Periodontol. 2004;75(9):1203-1208.
. A proposed model linking inflammation to obesity, diabetes, and periodontal infections. J Periodontol. 2005;76(11):2075-2084.
. Effects of periodontal therapy on glycemic control and inflammatory markers. J Periodontol. 2008;79(5):774-783.
. Effect of periodontitis on insulin resistance and the onset of type 2 diabetes mellitus in Zucker diabetic fatty rats. J Periodontol. 2008;79(7):1208-1216.
. Adipokines and inflammatory mediators after initial periodontal treatment in patients with type 2 diabetes and chronic periodontitis. J Periodontol. 2010;81(1):24-33.
. Screening for type 2 diabetes. Diabetes Care. 2003;26(1):S21-S24.
. Performance of an A1C and fasting capillary blood glucose test for screening newly diagnosed diabetes and pre-diabetes defined by an oral glucose tolerance test in Qingdao, China. Diabetes Care. 2010;33(3):545-550.
. Position statement: screening for type 2 diabetes. Diabetes Care. 2003;26(S1):S21-S24.
. Position statement: Standards of medical care in diabetes-2012. Diabetes Care. 2012;35(1):S11-S63.
. Screening for type 2 diabetes mellitus in adults: U.S. preventive services task force recommendation statement. Ann Intern Med. 2008;148(11):846-854.
. Glucose challenge test screening for prediabetes and undiagnosed diabetes. Diabetologia. 2009;52(9):1798-1807.
. Diabetes in the dental office: using NHANES III to estimate the probability of undiagnosed disease. J Periodontal Res. 2007;42(6):559-565.
. Position statement: Diagnosis and classification of diabetes mellitus. Diabetes Care. 2010;33(1):S62-69.
. Follow-up report on the diagnosis of diabetes mellitus: report of the expert committee on the diagnosis and classification of diabetes mellitus. Diabetes Care. 2003;26(11):3160-3167.
. International expert committee report on the role of the A1C assay in the diagnosis of diabetes. Diabetes Care. 2009;32(7):1327-1334.
. A new look at screening and diagnosing diabetes mellitus. J Clin Endocrinol Metab. 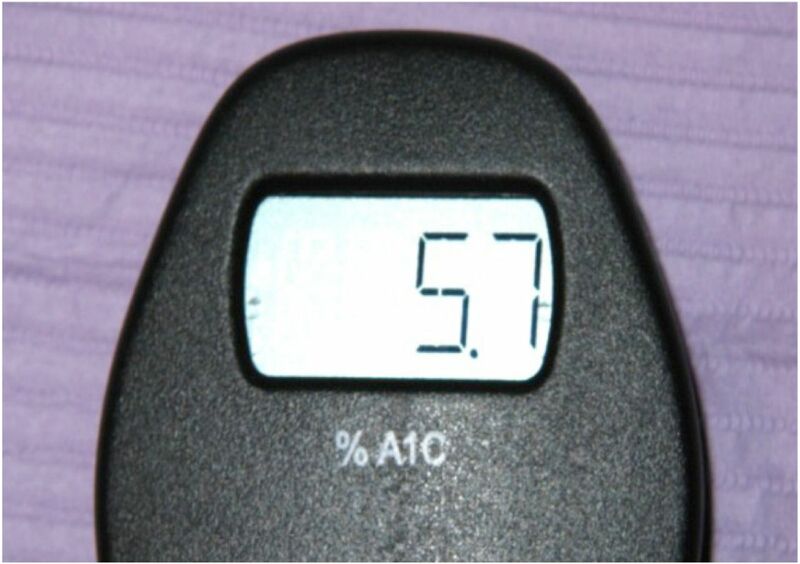 2008;93(7):2447-2453.
. Diabetes risk calculator: a simple tool for detecting undiagnosed diabetes and pre-diabetes. Diabetes Care. 2008;31(5):1040-1045.
. Discovering statistics using SPSS. Thousand Oakes [CA]: Sage; 2009.
. Diabetes trends in the U.S.: 1990-1998. Diabetes Care. 2000;23(9):1278-1283.
. Disparities in the prevalence of diabetes: is it race/ethnicity or socioeconomic status? Results from the Boston area community health (BACH) survey. Ethn Dis. 2009;19(3):288-292.
. Standards of medical care in diabetes--2006. Diabetes Care. 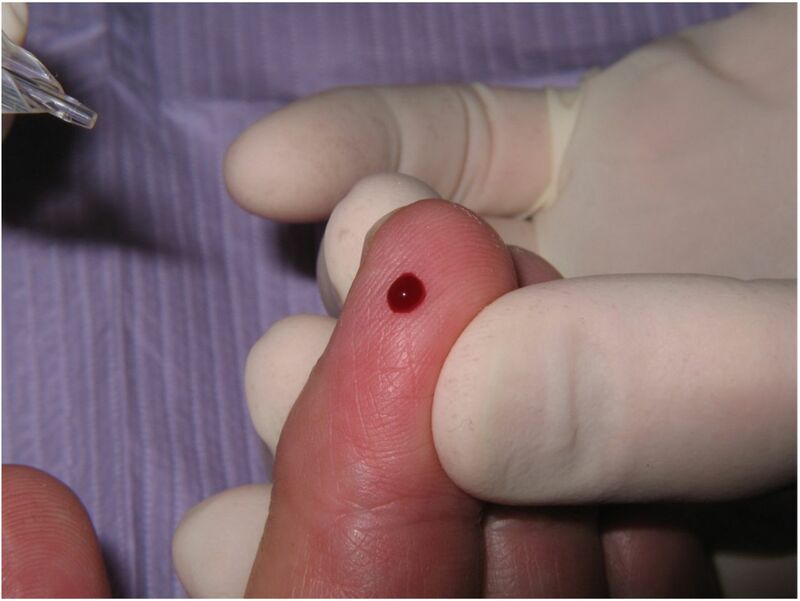 2006;29(1):S4-42.
. Opportunistic screening for diabetes in routine clinical practice. Diabetes Care. 2004;27(1):9-12.
. Diabetes and Inflammation: Implications for the dental hygienist. Access. 2007;21(5):43-46.
. Health professions education: a bridge to quality. Washington DC: National Academies Press. 2003.
. Dental Findings and Identification of Undiagnosed Hyperglycemia. J Dent Res. 2013;92(10):888-892.
. On the primary care frontlines: The role of the general practitioner in smoking-cessation activities and diabetes management. J Am Dent Assoc. 2005;136(8):1144-1153.
. Exploring our role as health care providers: The oral-medical connection. J Am Dent Assoc. 2005;136(6):716-720.